Just What Is a Capacitor Calculator? 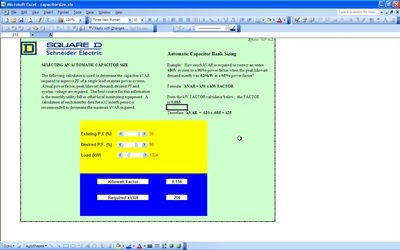 A capacitor calculator is utilized to determine capacitor, using the three digit code, that appears on the side. In order to do this, you’ll need to input required codes in empty fields, and then click on the calculation box where the determined value will then appear. For instance, when the digit on the far right is marked zero, at that point, your code might be a pF value, in lieu of the three digit code. Now, when the far right digit isn’t zero, then likely, your value will appear as coded. So, both times the value would show up as the 100pF number. Don’t forget that if your capacitor code is just two digits, why then, that will be depicted as the actual pF value, in picofarads. Most people are aware that the purpose of a capacitor calculator is to figure out the value of the particular capacitor, as determined from the usually three digit code that’s printed on the side. So, this is readily and quickly done when you input the code in the designated Excel boxes and then click the button for the calculation. Now, Excel can manipulate spreadsheets with multiple rows and columns. So, large quantities of data are easily and rapidly figured and organized, within one spreadsheet. You can also start new tabs for other types of data that may be required. In addition, Excel can depict various kinds of graphical data, like histograms, box charts, pie charts, and line plots. The Excel templates will also permit users to refer to data cells with specific formulas, so that calculations may be duplicated and also displayed in a multitude of cells at the same time, a very useful feature.